The 16″ Acorn a classic Tiffany Studios shade design that can be created in a wide range of colors. 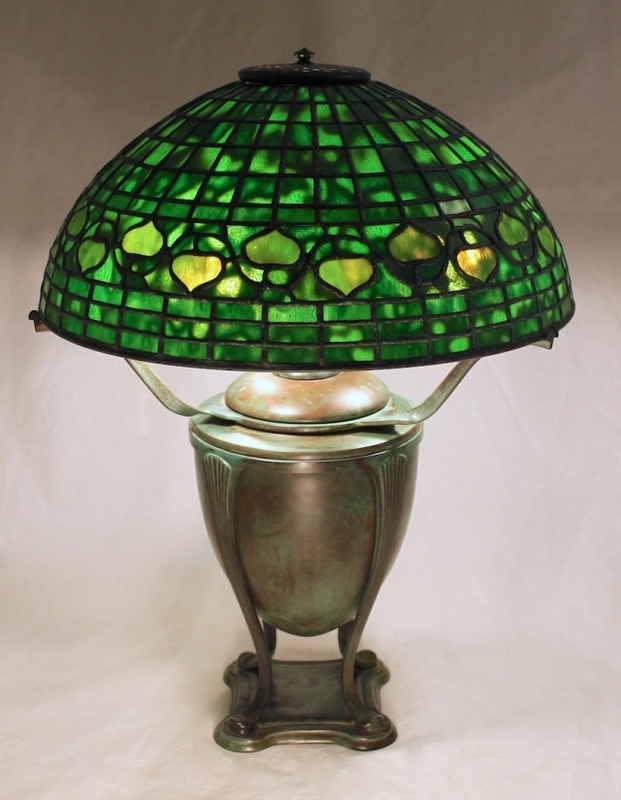 For this piece a heavily mottled deep green glass was chosen for the body of the shade with a slightly different green used for the “acorns”. The original Tiffany price list identifies this pattern as a “Vine border”, but acorn has become the common name for the shade. Commissioned by a local client, the shade is shown on the Greek Urn base (overall lamp height 21.5″ tall). Lamp of the Week: 14″ Tulip – The 14″ Tulip is a petite shade that reminds us that Spring is around the corner. Purple tulips with fresh green..